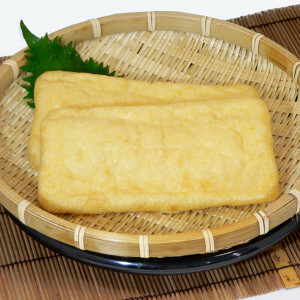 Abura-age is thin sheets of fried tofu that are most popularly known as the stuffed tofu pockets called ‘inari-zushi’. Another popular dish is in kitsune soba or kitsune udon, which is abura-age slices in noodle soup. Kitsune means ‘fox’ and in Japanese mythology this food is associated with Inari the fox deity, who is a messenger of the gods. Ankake is thick glutinous sauce made by mixing one cup of dashi with a tablespoon each of water, shoyu, mirin, and katakuriko starch, and simmering until thickened. Ginger juice is also often added for extra flavour. Firstly, blend the sake and sugar well, warm the hatcho miso in bain marie. When it’s cooled, add it to the sake. This is a water pepper: a purple or red small-leaved peppery sprout used in salads or often as a garnish. Regular dashi, the foundation ingredient in Japanese cooking, is made from konbu [kelp] and dried bonito fish flakes; however, vegan dashi is made using just konbu or a combination of konbu and dried shiitake mushrooms. To make the dashi, place a piece of konbu about 15-20cms long and 6-8 dried shiitake mushrooms in a container of 4 cups of water, seal the container and put it in the fridge for 24-48 hours. Or, if you can’t wait that long, put the ingredients in a saucepan on a very low flame and slowly bring to the boil. As soon as the first little bubbles appear, before it reaches a rolling boil, switch off the heat and leave the stock to cool naturally. 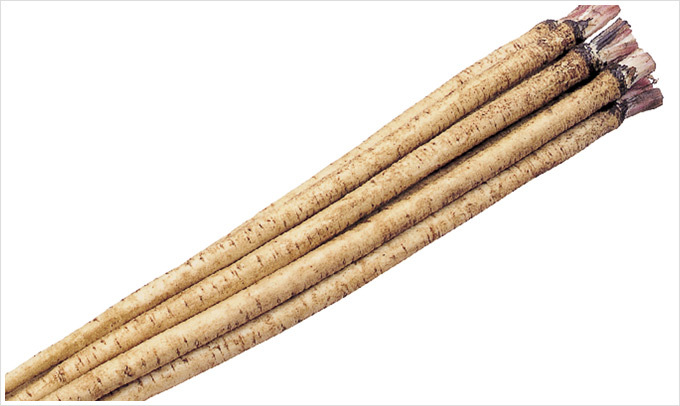 Gobo, known as burdock root in English, is a long slender root vegetable with a coarse texture and an earthy flavour. It is used extensively in traditional Chinese medicine and is gaining favour in Western kitchens, due to its promotion by the macrobiotic movement, because of its high nutritional value. 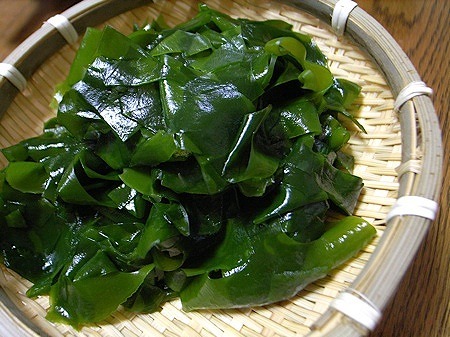 Hijiki is a highly nutritious sea vegetable that is usually sold dry, but when soaked in water expands into a fleshy mild-tasting seaweed that can be added to salads and soups. Hijiki is an important ingredient in macrobiotic cooking because of the high dietary fibre and also the large amount of trace elements such as calcium, iron and magnesium. In Australia, the import of hijiki has been banned by the Agriculture Dept because it has traces of arsenic. However, in my opinion this has been an over-reaction because hijiki has been used for centuries in Japan, even as medicine, with no adverse effects. In fact, the Japanese government responded to the Australian ban by saying that only very small quantities of hijiki are eaten in a meal and there is no need for alarm. I still buy hijiki when I am in Japan and I have no trouble bringing it into Australia for personal consumption. I also have friends send it to me by post and have no problems with Customs. I highly recommend hijiki as a healthy and delicious food that is great in salads and soups, but as with all thing, moderation is the key. Junsai is a small Brasenia aquatic plant that is covered in a thick mucilage which gives the plant an interesting texture that is much prized in Japanese cuisine. It is harvested from ponds in the summer. Sprouts made from daikon seeds. You can substitute radish sprouts to get the same peppery taste. Although the name ‘katakuriko’ traditionally referred to a flour made from the root of a variety of lily grown only in Japan, nowadays ‘katakuriko’ is commercially made from potatoes. It is used as a thickener, but you can replace it with cornflour/cornstarch or arrowroot without any significant change in flavour or texture. Kanpyo is the dried stripes of the calabash gourd. They are rehydrated in water or cooked in dashi stock and can be used as an ingredient in sushi rolls or work as convenient edible ties. 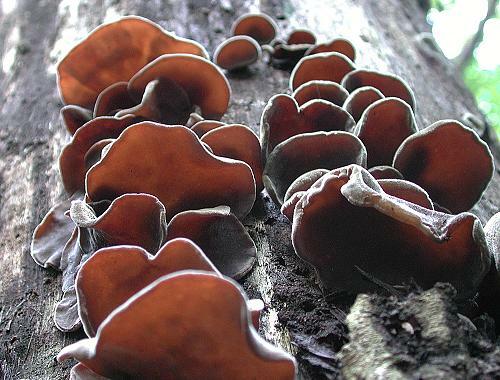 This mushroom, known in English as Jelly Ear, has a soft jelly-like texture. It is very popular also in Chinese food. 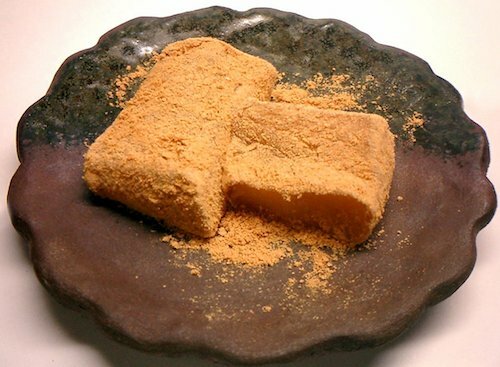 Roasted soy bean flour, used to cover glutinous sweets such as warabi-mochi and dango. Kinome are the fragrant news leaves of the Japanese prickly ash tree (also called Szechuan pepper tree) that grow fresh and tender for a brief time in spring. They have a mild peppery flavour with a hint of citrus. The seeds of the tree are called sansho, which is known as Japanese pepper. Referred to sometimes as “Japanese arrowroot”, kuzu is a starch made from the kudzu vine. It is used as a thickener in sauces, particularly ankake. Although it is possible to substitute kuzu with cornflour or cornstarch, kuzu gives the food a higher glossy sheen, in which case, arrowroot is a better substitute than cornstarch. Mibuna is one of Kyoto’s designated traditional vegetables called kyo-yasai, which feature in Kyoto’s unique culinary genres such as obanzai style cooking. It is a mustard green with a delicate flavour that is a naturally occurring hybrid of mizuna. Mibuna is at its peak in the middle of May. The name means a “herb that comes from Mibu,” which is an area in Kyoto city surrounding Mibu-dera, a 1000-year-old temple that is famous for its Kyogen (comic Japanese drama). Nowadays, mibuna is mainly produced by small family-based farmers in Hiyoshi village, just north of Nantan city in Kyoto prefecture. Also called ‘cotton tofu’ or ‘firm tofu’, this is a dense textured, firm tofu that is useful for mixing with other ingredients because it holds everything together so that you can shape it, such as forming into balls for adding to soups or deep frying. You can also slice it and it will keep its shape without crumbling, so you can marinate it and fry it. Momiji-oroshi literally means “grated autumn leaves” but refers to the rich red colour that results when dried chillies are placed inside a daikon radish and then finely grated, using a special grater that is just for making daikon-oroshi. Myoga is the edible flower bud of a variety of ginger that grows in Japan and Korea. It has a lovely crunchy texture with a mild ginger flavour. You could replace it with green ginger but it is quite a unique flavour. Rakkyo (Allium Chinense) is a type of Japanese scallion or shallot. Originally from China, it is widely cultivated throughout East and South-East Asia. It has a mild flavour that offsets strong flavours, and is most often found in Japan in a pickled form that is served with curry. Shiso, known in English as perilla or beefsteak plant, is a herb that is often used to flavour and garnish Japanese dishes. It comes in two varieties: a purple-leaved variety called akajiso (red shiso) which is the ingredient that makes umeboshi (pickled plums) appear red; and a green-leaved variety called aoshiso (green shiso) which is often used as a topping for noodles or as a garnish. The dried form is extensively used in shojin cuisine because it is the key ingredient, with konbu, in making vegan dashi, the stock that is used as the base in many recipes. The dried form is often preferred because it is rich in umami. The fresh mushroom is delicious simply grilled. Sudachi is a small, green citrus fruit that is valued for its fragrant, tart juice, which is particularly associated with matsutake mushrooms. This is a popular hot chilli used mostly in its dried form in Japanese cuisine and for pickling. It literally means “hawk’s claw” because of its characteristic claw-like shape. Takenoko means “bamboo shoots” and they are delicious when they first come up from the ground in the spring. They are traditionally associated with spring and used most often in a simple form that allows the delicate sweet flavour to be highlighted. The preparation of takenoko requires the roots to be boiled in water with rice bran which draws out the bitterness and makes them tender enough to eat. Light soy sauce that is often favoured in shojin cuisine because of its paler colour. However, caution is advised because although it is a lighter colour, having used amezake in its production, it is actually higher in salt than regular shoyu. Therefore, use less quantities than you would normally use regular shoyu. Wakame is a mild-flavoured seaweed that goes well with so many dishes in Kyoto cuisine, both hot dishes like soups and also in salads. It is most often rehydrated from the dried form but is especially delicious when obtainable fresh in spring. Yamato-imo, ‘mountain potato’, is a type of yam that has a wonderful culinary feature that is much prized in Japanese cuisine – when grated raw it produces a cloudy mucilaginous mound, which is very slimy, rather like the texture of raw eggs. Although ‘slimy’ conjures up something distasteful for people who do not have this texture featured in their cuisine, it is an important texture in Japanese cuisine and is found in that other much-commented on Japanese food: ‘natto’. The taste of yamato-imo is mild and so it is mixed with other ingredients mainly to produce this particular texture. It is a rather unique vegetable and I haven’t found anything to substitute for it; however, I include it in recipes on this blog to show its use and versatility. The skin of the yamato-imo has a skin irritant in it and so it needs to be handled carefully and placed in a vinegar and water solution first before peeling. The flesh of the yam does not have this irritant but should still be placed in a vinegar solution to avoid any of the irritant remaining. Yuzu is a small, orange citrus fruit that is valued for its fragrant zest and tart juice that is reminiscent of oranges or grapefruits but which is difficult to substitute in Japanese cuisine because of its distinctive aroma. Yuzukosho is a popular condiment made from yuzu zest with chillies and salt.